ENROLL BEFORE MARCH 1st AND SAVE 20% OFF YOUR DEPOSIT! We are excited to offer a fully online registration process. Simply follow the steps below to complete your registration online. You may also use the paper forms, found HERE by filling them out and bringing them to the front desk along with your deposit, or by filling them out and mailing them in with a check. Click the button below to open our Parent Portal. Follow the instructions to log into/create your account. Once logged in, click on the “Camps” section and then click the “Enroll Now” button. Select the weeks you’d like to enroll your camper and submit the request. Look out for an approval email shortly after. We will run the $50/week/camper non-refundable deposit upon approval of your request. Filling out a summer camp form has never been easier. We’ve built a smart, consolidated form for the whole family. 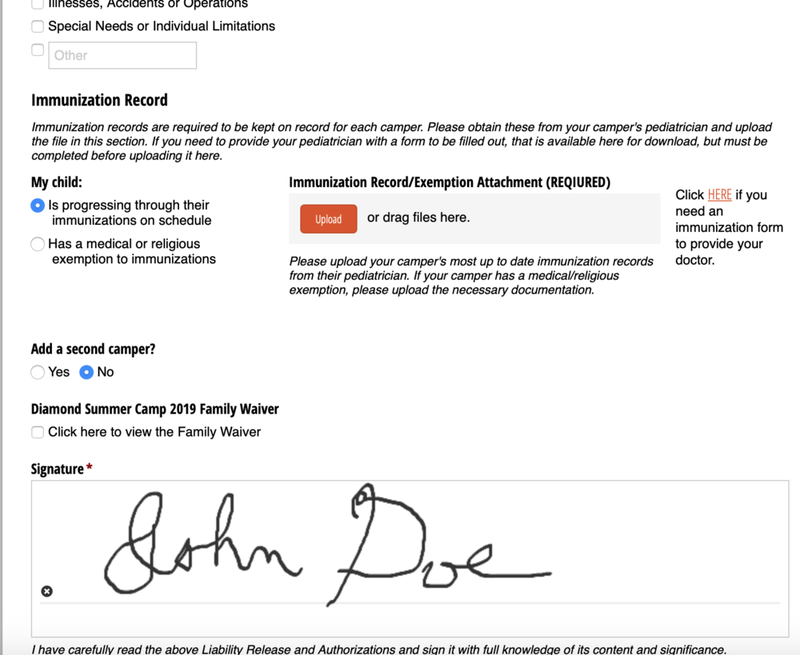 Have immunization records ready to upload and insurance information handy. Click the button below to fill out the form. The Family Form is due no later than 3 weeks prior to the campers first enrolled week. To pay online, log into the Parent Portal and navigate to the “Make a Payment” screen, or click the button below. You can also pay by cash or check - call the front desk for these methods. Total Tuition is due June 3rd for Camp weeks 1-5 and July 8th for Camp weeks 6-10. The tuition will be run automatically from your payment information on file if not paid before these dates. All payment receipts are available in the Parent Portal. If you have any questions, please contact us. Thanks for choosing Diamond Summer Camp!